The UX (User Experience) of a WordPress product plays a decisive role in making it a super hit or providing it with a deathblow. A well-defined UX helps users interact with the product, makes your product easy to use, and helps users engage with your product. Gaining momentum among users and making their lives easier should be the ultimate goal of a WordPress product. People are used to doing stuff their way. Certain conventions can hard to break. When you design or develop something that people don’t want to you use, the product fails miserably. Here’s a common user experience example in the design community. Much has been written about how to improve the UX in WordPress itself. But, when it comes to the UX of WordPress products, it’s relatively unexplored. In my previous article, we learned that the current UX of WordPress products is broken and needs a hefty revision. Apart from being functional, a better UX should be comprehensive and detailed yet simple. Being consistent is key. If you’re opting for something that veers from the traditional WordPress flow, then you’re making things difficult for the users. They’ll abandon your product sooner rather than later. In this article, we will look at the different ways to improve the UX of WordPress products. I’ll focus primarily on the techniques that I studied specifically when I encountered a UX problem with my product. Note that these tips are based on my personal experiences and may or may not be applicable to your product. Let’s get started! Greeting users with a welcome page is one of the best ways to improve the UX in WordPress products. Immediately after the user hits the ‘activate’ button, they are redirected to a welcome page that summarizes your product in the best possible way. A welcome page will not only help introduce your products or its features but it can display information about getting started, security fixes, promotional videos, subscription forms, FAQs, and so on. In short, it contains the necessary info to help with user-engagement. The fundamental idea behind it is to provide some quick and handy information right after a user installs the product. Later in the series, I’ll explain how you can add a welcome page in your WordPress Product. Admin Pointers were introduced in WordPress version 3.3, to allow users to explore new features in major releases via navigation. Later, they were used by plugin and theme developers to draw the attention to relevant features. This reduces the chances that users miss out any of the product’s features. Admin Pointers can be built via custom code or plugins designed for this very purpose. As a developer, I prefer coding it myself. But you can choose the Better Admin Pointers plugin to add custom pointers to the admin pages. Let me share a useful tip regarding admin pointers: Use them sparingly. A very thin line exists between a good and a poor UX, and, adding too many pointers overcrowds the admin page; which frustrates the user. Adding support forms is a great way to improve your interactivity with users. I am talking about adding a support form inside your WordPress Product so that users don’t have to navigate to the support portals to look for support. You also shouldn’t require users to share their license code with you in order to get a valid support request verification. You can create an exclusive ‘Help Tab’ inside your options to cater the queries. Within this tab, you can create a support forum through which your users can get in touch with you. 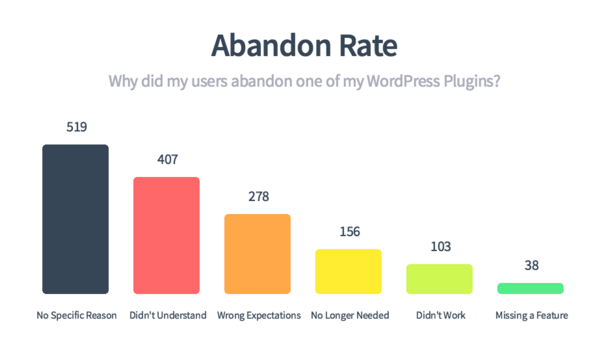 Did you know that more than 20 percent of the users that install your WordPress plugin will abandon it in fewer than 15 minutes? Wouldn’t you want to know why? Of course you would! Bidding a decent farewell is also a part of good UX in WordPress. There’s often a huge disconnect between the developer and the users. For example, a WordPress plugin can have more than a million active installs but the developer will hardly know the identity of its users. What if the users start abandoning the plugin? It gets difficult for the developer to find out the possible reasons behind this. How do you calculate your Churn Rate (the annual percentage rate that customers stop subscribing to a service)? Users get a nice farewell. Users can provide feedback as to why they are abandoning your product. Based on their reviews, you can improve the product at a later stage. You can ask users to rate the product and support to figure out what people think of your business. And finally, the overall UX gets improved. More than 90 percent of my users let me know why they are leaving through this form. The question is, how can you have such a form integrated with your product? Well, adding a form like this has a few pre-requisites. DATA: You need to have your user’s information. This means you need to ask for the permission from your users. You can do this easily by adding a sign-up form right before your product’s welcome page. Here you can gather the user’s permission to connect their site with your server (API based host where you store their data). Deactivation Form: The deactivation form, which connects with your server and adds the reason of abandonment against the particular user’s table in your database. This kind of solution can be built on your own, but instead of doing that, I rely on a service called Freemius. Freemius Insights helps me to track my user’s engagement level. I know when a user needs support or why a user deactivates my plugins. By now you have learned some ways to improve the UX of your WordPress products. In my experience, the welcome page had the biggest impact on UX. I added a welcome page in CF7 Customizer plugin, which solved the biggest problem I encountered: users didn’t know what to do next and how to get started with it. I also got in touch with Vova Feldman (founder of Freemius) and started collecting the user feedback. I had the choice of all the options described above but adding a welcome page, support tab, and collecting user’s data were the most worthwhile. 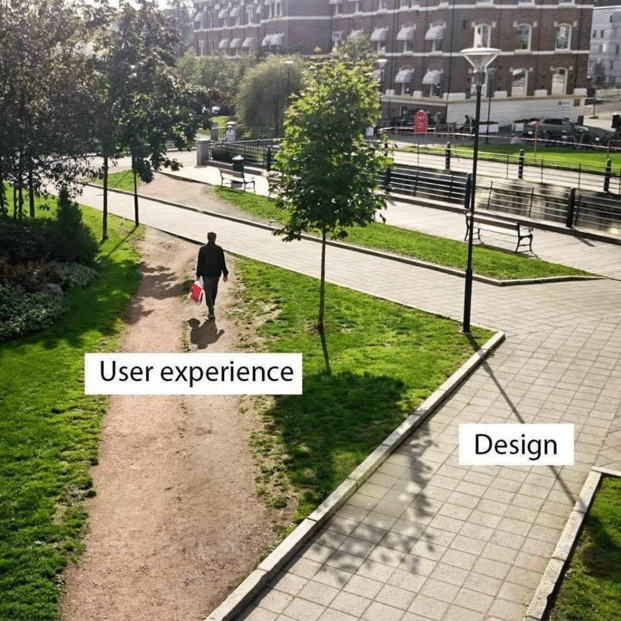 So, based on the complexity of your product, any of the aforementioned methods should improve UX. This is it for today. In the next article, I’ll explain how to code a custom welcome page for your WordPress product, why you need it, and what components it should have. As usual, don’t hesitate to leave any questions or comments below, and I’ll aim to respond to each of them!